This mint and grey chevron fleece lined cosy toes footmuff is not only a cosy, soft and comfortable addition to your pushchair but a bright and fun way to accessorise your My Babiie pushchair. The fleece lined footmuffs are made to the highest attainable standards and are a 100% top quality polyester footmuff. Cosytoes size: Length: 69 cm. Width: 45 cm. Please note: Pushchair not included! This mint and grey chevron cosy toes footmuff is not only a cosy, soft and comfortable addition to your pushchair but a bright and fun way to accessorise your My Babiie pushchair. 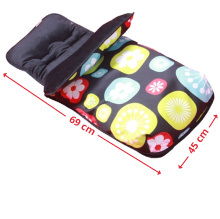 The fleece lined footmuffs are made to the highest attainable standards and are a 100% top quality polyester footmuff. Designed with toddlers in mind these cosytoes footmuffs have plenty of leg room. Love this cosytoes. Fits beautifully onto the buggy and keeps my little one warm when we’re out and about. Buggy will still fold flat with it on. Great for busy mums. My son loves his new footmuff. Keeps him nice and warm.